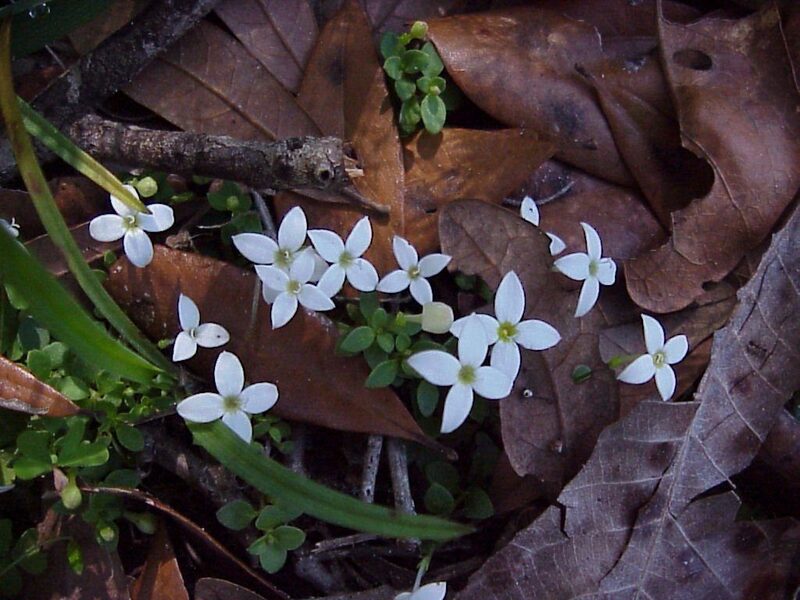 Wintertime finds tiny white flowers beginning to appear along the floor of the landscape, which is a stark contrast to the wide range of brown hues that are all around. The small star shaped flowers are those of a much overlooked native flower known as innocence. 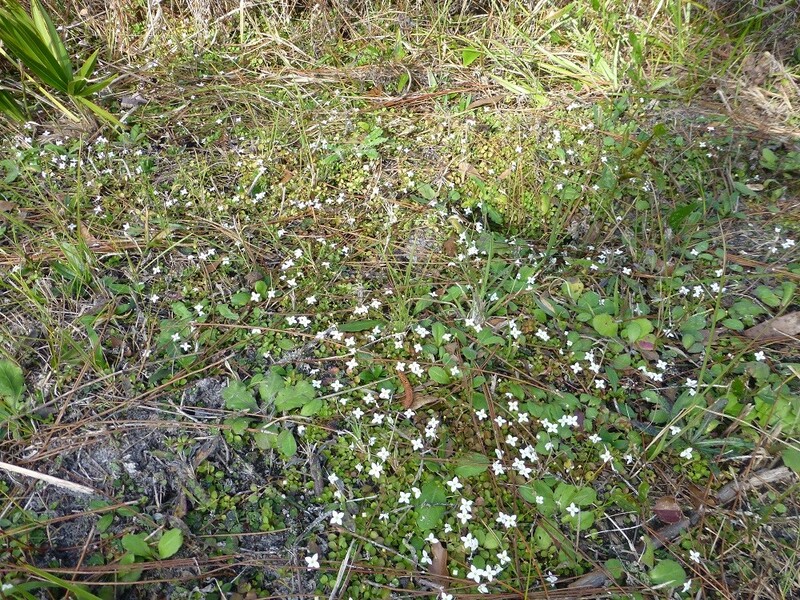 Innocence or roundleaf bluet (Houstonia procumbens) is a native ground cover in the Rubiaceae or madder family. It is also known as Hedyotis procumbens. 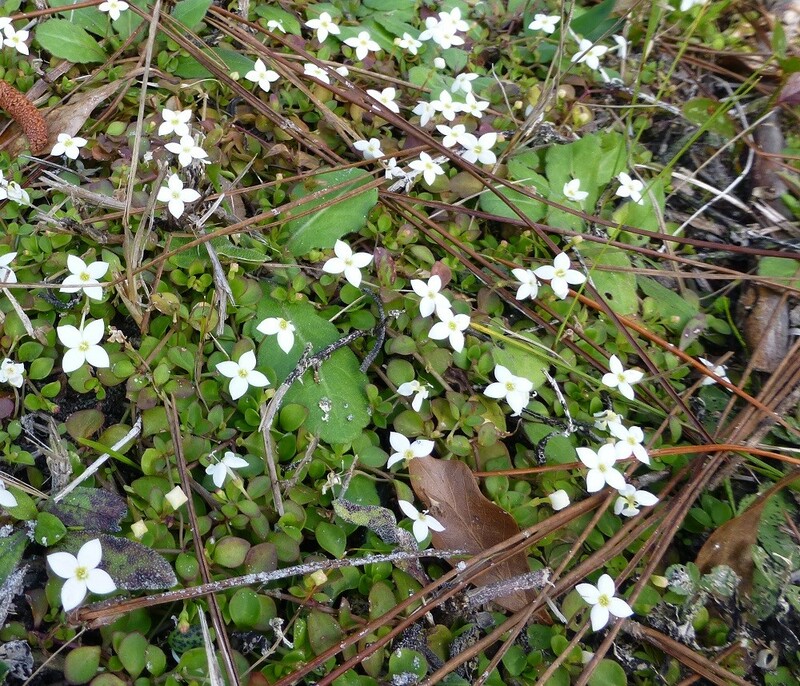 Innocence is a very low growing, mat forming, perennial wildflower that can be found in dry pinelands, flatwoods, sandhills, open woodlands, and disturbed sites in most counties of Florida. Its leaves are opposite, ovate to elliptic with entire margins, and have a succulent appearance. The plant rarely exceeds two inches in height, and generally no more than ten inches in width. The beautiful white flowers begin to appear in December and continue on until May. The flowers are four lobed and can be found in clusters or singly. The flower nectar provides for many insects such as bees, bee flies, and small butterflies. It is a very important nectar source during the winter months when fewer flowers are in bloom. Nurseries do not carry innocence, but it does easily transplant (to site or in pots) if care is taken to retain as much of the soil and organic matter as possible around the root system, and keep it well watered until established. It can be an excellent addition to a partially shaded area of the landscape and is incredibly beautiful in a partially shaded rock garden. If you are fortunate enough to have this lovely wildflower in your landscape share some with a friend.